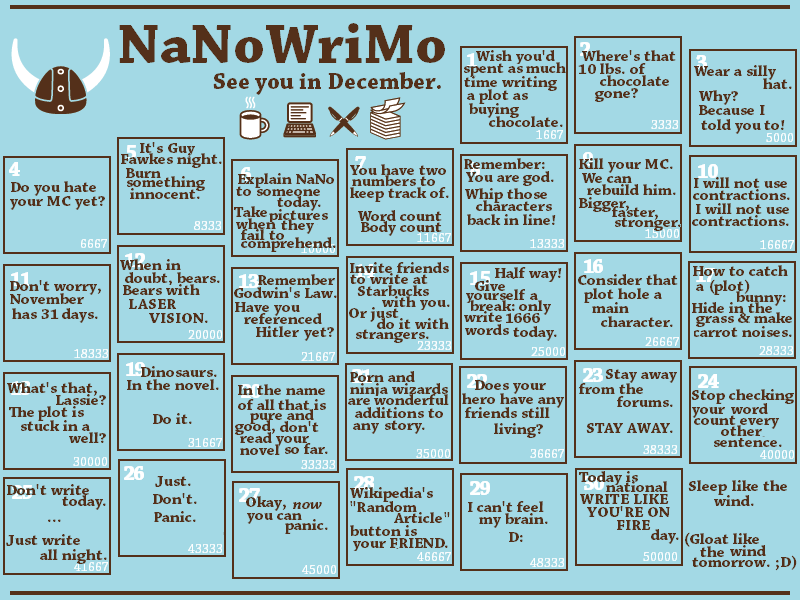 Today kicks off NaNoWriMo – or National Novel Writing Month for those not in the know. I wasn’t sure if I’d join the pool of crazy writers this year but when I woke up today, I had the itch to write again. So…I jumped in the deep in. I’ve already pumped out about 1,200 words in an hour! For a little more information, you can check out www.nanowrimo.org. A coworker, Carrie, introduced me to this organization many moons ago and I finally jumped about three years ago. I’ve written during regular NaNoWriMo in November as well as during camp months in April & June. For this program, you signup to write 50,000 words of a novel (or other work) in just 30 days. That’s about 1,667 words each day. Yes – per day. some days, i write 5,000 or more words and others I can’t write my own name. but on average, you have to get to about 1667 words a day to make this work. Those who know me well are going to harass me right now with, “where are the other two novels?! Why aren’t they published yet? !” Well…that’s a harder process. There’s editing and finding an agent or publishing independently. 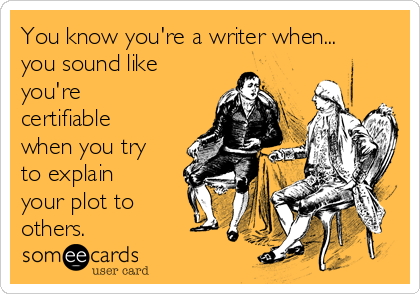 Writing is truly the easy part for me. Making it GOOD is harder. Others are going to ask why I’m not writing the third novel in my series. Honestly…i don’t know. I don’t really hear their voices at the moment. I feel like I was kicked out of the inner circle. Eventually I’ll get back to that story. right now…I’m intrigued and inspired to write this new one. Even Stephen King took a hiatus from the Dark Tower and Dean Koontz had time between Odd Thomas novels. I’m no where NEAR their levels, so gimme time to get back there. It’ll happen. I don’t have a good title yet. For now, it’s S.W.A.P. (And no, I’m not telling you what that stands for yet.) Essentially it’s a look at the multiverse through the eyes of a normal twenty-first century middle class woman. Don’t worry. It’s not sci-fi! There won’t be a lot of quantum mechanics or things only Sheldon & Leonard would understand. But it will get you thinking, wondering and seeing the universe and the idea of time and space in a bigger way…I hope. I won’t give too much away with a summary quite yet, but I will give you…Chapter One! Yes – the first chapter of a not yet written book. Gimme your thoughts after you read below. Do you want to read more? Are you intrigued or already bored? Tell me!! “And you’re sure there’s no statute of limitations or anything like that?” I knew the kind-voiced woman on the other end of the communication must be inwardly cringing at the quality of desperation in my voice but I couldn’t curb it. I wouldn’t be the first half-crazed persona to have contacted her since her day started – hell, since she’d started working there – and I certainly wouldn’t be the last. But that didn’t mean I had to like that about myself. The words were nearly scripted in their professionalism and precision. That didn’t make them any less painful. Her nearly-robotic voice was meant to be soothing but her words tore through my heart. The portal picture dissolved after she broke the connection. I stared at the blackness and tried to hold back the tears. Futile effort. Knowing I needed to just let it out, I ran up the stairs and dropped onto the bed, my face buried in the over-soft pillows my husband preferred. Another year of hoping, wishing, fervently praying to a deity I no longer believed in and still…nothing. No additional matches in a year. Thirty minutes later, my tears were finished and I pushed myself up from the bed. A quick trip to the washroom cleared the salty residue from my cheeks and an application of mascara, blush and gloss brought me back to looking normal again. I returned to the kitchen and saw the brochure on the counter. Before I returned it to Betty Crocker Cookbook where I kept it hidden, I flipped through it again. The slam of the back door echoed in harmony with the slam of the cookbook on the counter. My son rolled his eyes at me he came in with the dog in tow. “Jesus, mom. It’s just dinner. You don’t have to be so dramatic about it!” His changing teen voice held all the wisdom of his fifteen years and I ignored the nails-on-chalkboard quality. “Of course, sweetie. And the dog gets choked when you pull on his leash like that.” I deftly pulled the worn blue leash from between his man-sized grasp and looked up to his big blue eyes. He might stand five inches taller than me, but I still had twenty pounds on him. Plus, I had that indefinable ‘mom’ quality that made me seem bigger to my children. I bit back my initial retort. No, we don’t have any breakfast, I plan to starve you. Maybe I have been too hard on my kids lately. Too sarcastic and caustic. Time to be loving and chill. I gave him a nudge to increase my personal space before I smoothed my long brown hair down. “Mitchell! You know I hate when you do that.” My semi-smile dropped into “the look” my children knew all too well. The chastisement that they’d known since birth. I couldn’t seem to go five minutes these days without assaulting them with it. Dammit. I tried! I wasn’t in a mood! I’d made breakfast for them, made sure their football uniforms were ready for this morning, made reservations for dinner, called SWAP, made myself up and was trying to be chipper. And, dammit, it was my birthday. When was someone going to do something for me? I opened the cookbook again and looked longingly at the brochure. Just two more matches. Posted on November 1, 2015, in Writings and tagged nanowrimo, National Novel Writing Month, new novel, writing. Bookmark the permalink. Leave a comment.